Adobe, the famous photo editing and sharing website, has just announced a strip down version of mobile web service that enables users to upload and share photos with friends directly from mobile phone. Currently this web service is still in beta version and only opened limited to US citizen, as similar to Skyfire web browser when it was released recently. With this mobile service, user has the option to upload photo directly almost anywhere anytime as long as there is Wi-Fi, 3G or HSDPA services. While it may not have full editing feature, but simple capability of photo uploading via mobile phone is good enough for average users. Just imagine now you can snap photo using mobile phone camera and upload it directly to website almost immediately. The free service is not only convenience to be used, but it also gives away 2GB online storage space for each registered user at no cost. Note that the “Plus” users will enjoy 20GB huge storage space at $49.99. In order to get a quick trial, user can do a simple registration at Photoshop. 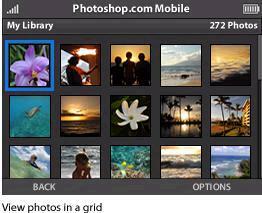 Alternatively, if you are surfing from your mobile phone, just key in m.photoshop.com and it will bring you to the download site. Currently the mobile service is only available for Windows Mobile phone models as listed here. Anyway, Photoshop promises to enable more compatible mobile phones in short future.